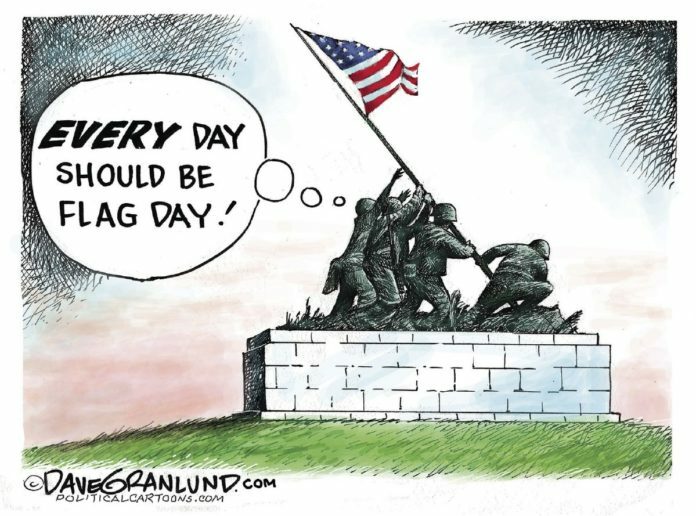 Today is Flag Day, which unfortunately is a rather lackluster holiday. Many Americans don’t even know it exists. Yet the history of Flag Day can teach us quite a bit about democratic practice, especially in light of today’s nationalistic fervor. Flag Day dates back to 1885, when Dr. Bernard J. Cigrand, a teacher in Wisconsin, planned a patriotic event for his graduating students. He selected June 14, the anniversary of the day in 1777 when the flag of 13 stripes and a blue field of stars was adopted. His pupils celebrated with patriotic exercises and flag-themed essays. Cigrand dedicated the remaining years of his life to creating a national Flag Day. He caught a big break in 1916, when President Woodrow Wilson declared a nationwide observance of Flag Day. The holiday changed dramatically. It became a spectacular showcase of American history and the nation’s preparedness for international conflict. More than 150 cities adopted Wilson’s call, organizing parades, pageants, and other commemorations. Wilson maintained these happenings would combat the “influences which have seemed to threaten to divide us in interest and sympathy.” The goal was to invite citizens, especially immigrants, to show that they were dedicated to the nation above all. Flag Day became a tool used to galvanize people into a jingoistic patriotism. During the early 20th century, nationalistic holidays became pervasive. Americans were taught that showing oneself to be a patriot — wearing a flag pin, singing national anthems, draping one’s home in flag-inspired bunting — was more important than traditional democratic actions. The heightened focus on the display of patriotism created a panicked climate and abetted vigilantism. In 1917 in Jefferson City, Missouri, a crowd beat a man of German ancestry when he drunkenly praised a German war-battle win. German-Americans were asked to kiss the flag, their churches painted yellow. And in 1918, residents of Collinsville, Illinois, lynched Robert Prager, a socialist German miner, after parading him through town draped in the American flag. President Donald Trump has adopted his own overwrought vision of patriotism. America First, of course, was a slogan first engineered by Wilson to bolster isolationism. The connection of the slogan to Trump’s fascination with a wall and his order to ban Muslims is clear. Throughout his campaign and now into his presidency, absolutist appeals to patriotism are held paramount. These actions show what can happen when citizens base their judgments on simplistic standards. Even absent eruptions of violence, overbearing understandings of patriotism can impede robust democratic engagement. This year, let’s use the occasion of Flag Day to reflect on what the flag represents — a nation held together not by the façade of patriotism but by a commitment to democratic, inclusive ideals.